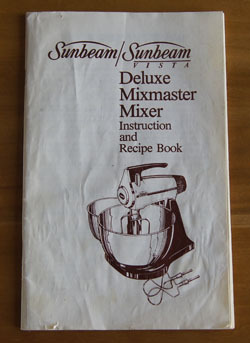 Cookbook #108: Sunbeam Deluxe Mixmaster Mixer, Instruction and Recipe Book, Sunbeam Appliance Company, 1983. I dug this little book out of the “instruction booklet” pile because . . . well, because I am organizing my kitchen storage area in our basement and found my old Sunbeam mixer. But, it’s missing both of the bowls that came with it. Shall I toss the mixer? Can I still find replacement bowls for this old appliance? Maybe I can find the model number in this instruction booklet to help me locate the bowls. First: Does this mixer still work? I plug it in and – yes! The motor whirs! I search the Internet for “Sunbeam Mixmaster”. I soon realize that my mixer is not “old”, it is “vintage”! I place a bid on eBay for a replacement bowl, and then follow some links on the history of Sunbeam Mixmasters. 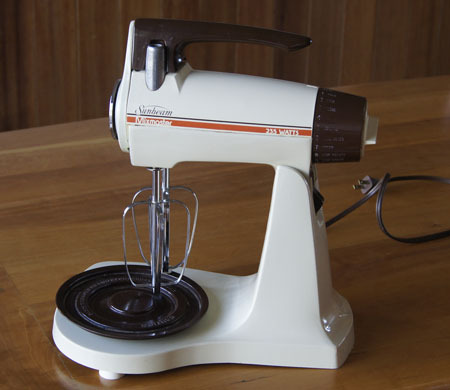 The first electric mixers were introduced to the American public in 1915-1920. Sunbeam mixers were introduced in the early 1930s, after Ivar Jepson joined the Chicago Flexible Shaft Company. Jepson was a prolific inventor, and thanks to his inventions, the company did well even during the great depression. He was with the company – which changed its name to “Sunbeam” – until 1967. He is known as “Mr. Sunbeam”. Here is an article on the vintage history of Sunbeam Mixmasters, written by a collector. Retro Kitchen Mixers is another good read. This one helps mixer-owners determine which model from 1930-1967 they own. So my old Sunbeam is up and running again. I don’t really know why I replaced it with a new KitchenAid. Perhaps I was using it for kneading bread and it just wasn’t powerful enough for thick doughs. I remember one of the Sunbeam beaters collapsed while making Turtle Brownies and I had to order a new one. I have decided to keep this 1980s mixer because it is: Vintage! Since I have the Sunbeam Deluxe Mixmaster Mixer recipe booklet in my hand, and since it is entered in my database of 250 cookbooks, I decide to cook one of the recipes for this blog. There are only about 40 recipes in this cookbook, most of them are good old American basics. I decide to make Banana Nut Bread, partly because I have plenty of ripe bananas on hand. This Sunbeam version of banana bread is different from my usual recipe in that it has butter in it and a lot of brown sugar. Perhaps the extra sugar is not great for our health, but it sounds yummy! Put the flour, salt, and baking soda in the large bowl of an electric stand mixer and mix on low for a few seconds to combine. Add the sugar, butter, eggs, buttermilk, bananas, and walnuts. Mix on medium to medium high speed until thoroughly mixed, scraping sides of the bowl as necessary. Pour the batter into a 9x5x3-inch loaf pan. If your pan is non-stick, you probably don’t have to grease it. If not, grease and flour the pan. Bake at 350˚ for 60-80 minutes, until it tests done with a toothpick. This was excellent banana bread. Nice and sweet! Cookbook #107: New Creative Crock-Pot® Stoneware Slow Cooker Cookbook, Robin Taylor Swatt, Pascoe Publishing, Rocklin, CA, 2001. I come in from outside on a cool spring morning and a spicy, beefy aroma sends my senses racing. Ropa Vieja is in the crockpot! I think this is what I like most about slow cooker cooking. 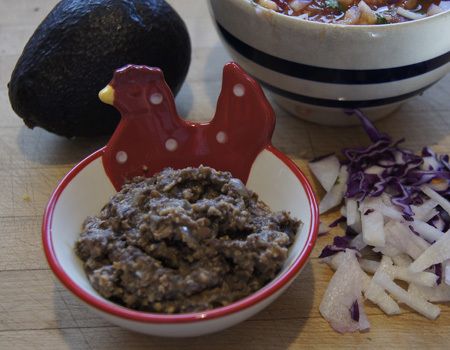 I found the Ropa Vieja recipe in the New Creative Crock-Pot® Stoneware Slow Cooker Cookbook. I have covered other crock pot or slow cooker cookbooks in a few other posts in this blog; some history of crock pots and my opinionated thoughts on them is in this blog post. To find my crock pot recipes, search my website for “crock” or select the category “slow cooker” or go to the recipe index. The New Creative Crock-Pot® Stoneware Slow Cooker Cookbook is nicely presented and pleasant to leaf through. 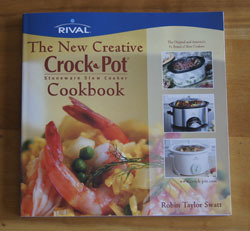 The introduction is written by the “Rival® Kitchen”, and throughout, Crock-Pot is followed by the obnoxious-to-type “®“. No introduction is given by the author. Notes in this cookbook indicate that I have tried several recipes from this book: a tomatillo chicken, beef roast, and a hoisin chicken. I like the section entitled “from around the world”, and I appreciate the low-fat section. In my opinion, too many of the recipes call for prepackaged seasoning mixes but other than that, most of the recipes I could try. But I probably won’t. I usually cook for just two, and my current Rival® Crock-Pot® is a 3-4 quart cooker, so it makes a lot. And I rarely need the time-saving convenience of a crock pot (a luxury of retirement). These days I mostly use my crock pot for things like pork green chili, spicy pinto beans from scratch, and shredded beef, dishes I usually cook from memory rather than from a recipe. Comfort food dishes I can make a lot of and freeze some for later meals. I buy a large (and expensive) flank steak. Instead of vegetable broth, I use my own beef stock. I stay with just carrots in the cooking liquid, although I want to throw in onions and garlic. (I know the carrots will just be mush after 7 hours cooking, but they should add some flavor!) I can’t resist adding some spices, like chili powder, cumin, and cayenne. I toss in half a chili pepper that I have in the ‘fridge. Instead of making the tomato-chili-broth and serving the dish like a stew, I decide to use the shredded beef sans sauce in burritos. Okay. I mangled the recipe. 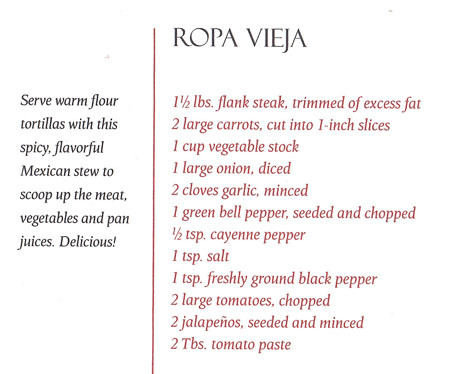 But Ropa Vieja gave me inspiration, and often that’s all I look for from my cookbooks! Put the stock and spices (and chili pepper, if using) into a 3-4 quart slow cooker, then add the flank steak. Cook on low 7-9 hours or high 3-4 hours. 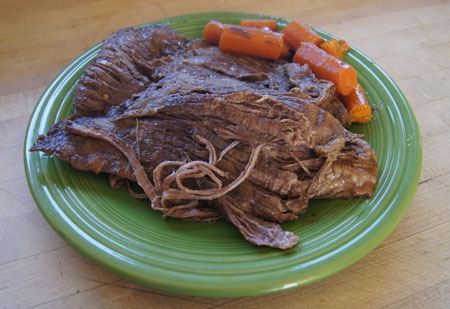 The shredded beef is done when it falls apart when you grab some with a fork. Look at the big ropes of shredded beef! The turned out perfect. It was great mixed with onions and beans and cheese in flour tortillas. I had lots leftover for other meals. 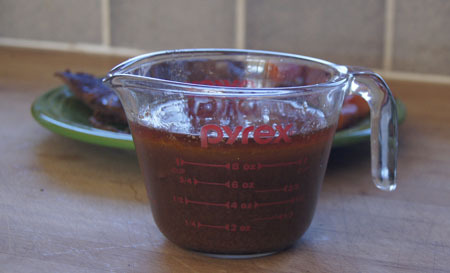 I put the cooking liquid in the refrigerator and a few days later removed the hardened layer of fat. I put it on the stove and thickened it with cornstarch, and mixed it with some of the leftover shredded beef (and olives and onions and cheese) for enchiladas. Yum! 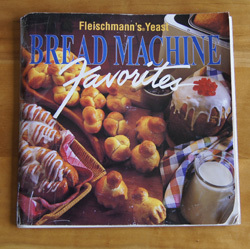 Cookbook #106: Bread Machine Favorites (Fleischmann’s Yeast), Copyright by Specialty Brands, a Division of Burns Philp Food Inc., San Francisco, CA, 1994. Tested in the Better Homes and Garden Test Kitchen, a registered trademark of Meredith Corporation. This is a great cookbook. I have thumbed through it many times and it shows! I keep it with my other favorite cookbooks, near the Joy of Cooking. These are the recipes I have tried and liked in Bread Machine Favorites: Blueberry-Lemon Bread, Cottage Wheat Bread, Pumpkin-Nut Bread, Zucchini-Carrot Bread, Old-Fashioned Cinnamon Rolls, and Dried Cherry-Almond Bread. 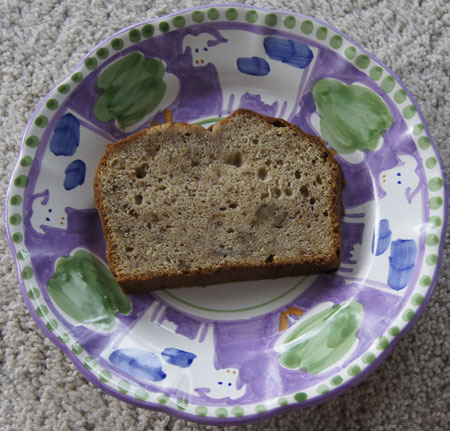 The one I used to make almost weekly is Cottage Wheat Bread. It has cottage cheese in it, therefore a little added protein and calcium. Plus it’s just a darn good whole wheat bread. Most of the loaf recipes in this cookbook call for baking the bread in the bread machine. It is my preference to bake yeast loaves in a conventional oven. 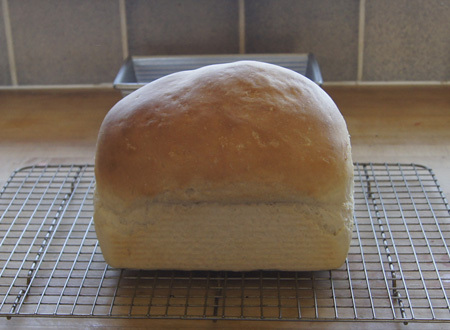 I bake a small loaf (8 1/2 x 4 1/2 inches) for about 22 minutes at 385˚, or until it is nicely browned. The Bread Machine Cookbook also has recipes for rolls and braided loaves, and those are baked in a conventional oven. About yeast. I like to know my yeast, so I buy it in two-pound packages (and I usually do not buy Fleishmann’s yeast, not that it isn’t good). By always using the same yeast, and using the bread machine to rise the loaves at a consistent temperature, I know I will get consistent results. After I acquire a two-pound package of yeast, I fill a small jar and keep it in the refrigerator, and store the rest in the freezer. Here is my discussion of bread yeast. 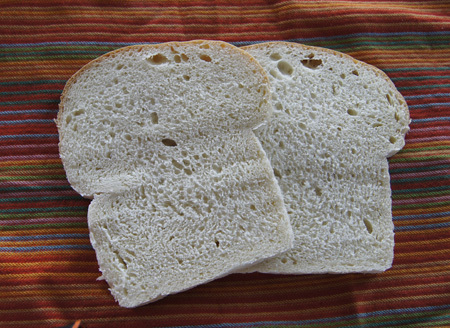 For this blog, I will try the “Basic Sourdough Bread”. About a year ago I purchased a sourdough starter from King Arthur Flour. Up until now, I have only used this starter to make no-knead rustic loaves. I have been very happy with the flavor and consistency of these rustic loaves loaves. They are not as sour as San Francisco sourdough bread, but I’m not sure that sort of sourness is possible in Colorado. In any case, they taste different than no-knead bread made without sourdough starter. Now I want to expand my sourdough repertoire to a kneaded loaf! I had to make a few changes in the recipe. As the bread kneaded, it was too dry, and I added at least 1/4 cup water to get the correct consistency. When I examine the “Sourdough Starter” directions in Bread Machine Favorites, I note that this cookbook directs to feed the starter with equal parts water and flour. My starter is fed with twice as much flour as water, therefore, 2 cups of flour in this recipe is too much. Below is my revised version, as well as directions for feeding my starter. Put all the ingredients in your bread machine and set to a dough cycle, or to a basic white bread cycle with medium color (baking) setting. If you have the bread machine do the baking, you just wait until it’s baked! If you want to bake the bread in the oven, transfer the dough to an 8 1/2 x 4 1/2-inch pan. Let rise at room temperature just until the loaf peaks a half-inch over the sides of the pan. Bake for 25 minutes at 385˚. repeat once a week, whether you are baking a sourdough loaf or not! The directions that came with my starter say to use freshly fed starter in a recipe. However, for the bread machine sourdough loaf that I make for this blog, I used unfed (just out of the refrigerator) starter and it worked great. In fact, it almost worked too well, as the bread rose a lot in the oven, as you can see in the photo of the loaf. I have an extra copy of Bread Machine Favorites! I liked it so much that I bought a copy to give away, then forgot to. Cookbook #105: Low-Carb Comfort Food Cookbook, Mary Dan Eades, Michael R. Eades, and Ursula Solom, John Wiley and Sons, Hoboken, New Jersey, 2003. Yes! This is the cookbook I want to do this week: a book of recipes for the Atkins diet. Why? Because I’ve been reading a new book about the possible advantages of including fat in your diet, and it has got me re-thinking my own eating plan (again). That book is The Big Fat Surprise by Nina Teicholz. It’s an interesting read and if I am ambitious, I’ll post about it sometime soon. The Atkins diet is high in fats and protein and low in carbohydrates. We tried this diet sometime in the early 2000s. I only lasted 4 hours on this diet – I just could not give up bread! My husband did better than me, and lost some weight, but he only stayed on Atkins for a few months. My big issue with the Atkins diet is a logical one: figuring out how to prepare interesting meals without bread, pasta, rice, potatoes or any other carbohydrate-laden foodstuffs. That’s why I bought this Low-Carb Comfort Food Cookbook when my husband was on Atkins: I needed ideas. This book gives a large variety of recipes to make meals less boring than a slab of meat and some salad. One I actually used a lot was “Mock Mashed Potatoes”, a dish made from whipped cauliflower, butter, cream, and mayonnaise. 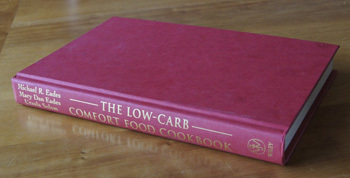 The Low-Carb Comfort Food Cookbook has recipes for breads such as rolls and loaves, as well as tortillas. But. Years ago I tried the recipe for “Almost No-Carb Bread”. This was quite a project, since it entailed gathering the following ingredients: almond meal, wheat bran, gluten flour, soy protein powder, and only a tiny amount of whole wheat flour. The wheat bran required a “toasting step”. The result of all the work? A loaf that had a taste and texture that did not appeal to us. Tortilla recipes with similar “flour pretenders” are also included in this book. They looked like too much work so I never tried them. This book’s main dish recipes for meats usually include added cream and butter. Since I was not on the Atkins, I had to cook separately for my husband. The Low-Carb Comfort Food Cookbook encourages the use of sugar substitutes, and I just don’t like using them. Cheese on the diet is limited to 1 ounce per day. (We love cheese.) 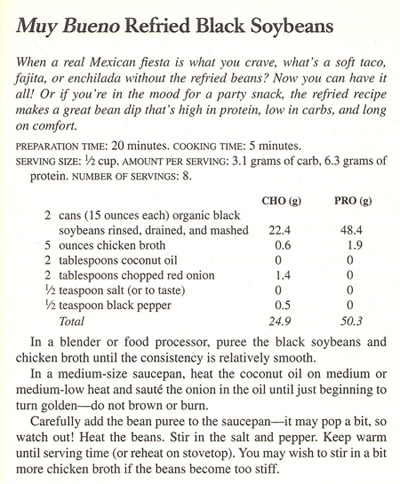 Back in the early 2000s, I was able to find very few low-carb products on grocery shelves or by special order (such as tortillas) but in general, such products were not as prevalent as they are today. Planning and cooking meals was no longer fun. I was quite happy when my husband abandoned the Atkins diet. I shelved this book and forgot I owned it until I was searching for this week’s blog entry. Now, I will definitely recycle this cookbook. I do need to cook a recipe from this book for this blog before I abandon it. After leafing through the entire book, I decide to make “Refried Black Soybeans”. I recently rediscovered soybeans. These beans are higher in protein and lower in carbohydrates than are most other beans. Here are the comparative values for pintos and soybeans (1 cup each, cooked; source: NutrientFacts). I liked these as a side dish for the tamales that I made for the same meal. I thought they were tasty, with a nice, kind of crunchy texture. But my husband went “bleh” and left most of them on his plate. I won’t make them again.